Campus: 1838 Guangzhou N Ave, Baiyun, Guangzhou, Guangdong, P R China. 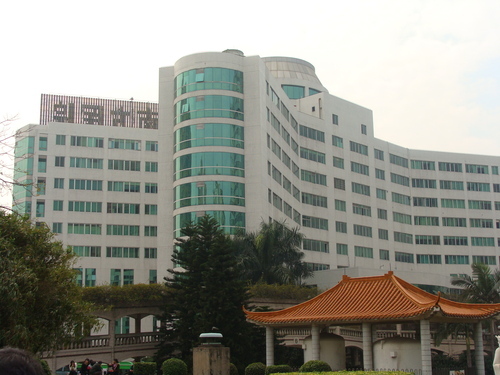 The First Military Medical University, now renamed as the Southern Medical University, is one of the premier Medical Universities of the Peoples Republic of China. Located at the foot of the picturesque Baiyun mountains, it covers an area of nearly one million square metres filled with lush greenery. The university has evolved over half a century now and now offers Bachelors, Masters, and Doctoral Degrees in Clinical Medicine, Traditional Chinese Medicine, Pharmacology of Chinese Herbs, Experimental Technology for Medical Use, Radiation Technology, Nursing, Medical Testing, Medical Imaging and Biological Medical Imaging. The Nanfang Medical University has 2 affiliated hospitals, Nanfang Hospital with over 2500 patient beds and Zhejiang Hospital with about 1000 beds. These hospitals specialise in diagnosis and treatment with Endoscopy, Cardiovascular Intervention, Hematodialysis, Organ Transplantation, Cryotherapy etc. In addition there is a 400 bedded hospital exclusively for foreign patients. The college is under the provincial government of Southern and is listed with the World Health Organisation (WHO) and International Medical Education Directory (IMED). Located at the foot of the picturesque Baiyun mountains, it covers an area of nearly one million square metres filled with lush greenery. Address: 1838 Guangzhou N Ave, Baiyun, Guangzhou, Guangdong, P R China. The First Military Medical University located at the foot of the picturesque Baiyun mountains in Guangzhou, together with it’s school in the suburbs covers an area of nearly 1 Million sq.mt. The University has 2 affiliated hospitals – Nanfung Hospital & Zhujiang Hospital, holding over 2500 hospital beds. Since 8th Five Year Plans the college has developed 300 new techniques in procedures such as diagnosis & treatment with endoscopy, diagnosis & treatment with cardiovascular intervention, hematodialysis etc. The Nanfung Hospital founded during China’s War of Liberation is a comprehensive, modernised hospital with sophisticated equipment, latest medical techniques, beautiful surroundings and quality service. More than 300 specialists & professors work in the 50 medical departments under it’s administartion. The First Military Medical University attaches strong importance to the integration of Science, Engineering and Medicine. The book centre of the college has a compilation of 1 million volumes as well as 2,300 Chinese and Foreign periodicals. In the 8th five Year project the university has undertaken more than 400 key projects for the World Health Organisation. It has close ties with many premier institutions of US, Britain, Japan, France, Australia and there are students from 10 countries studying in the university.